To satisfy a read, the DataStax Distribution of Apache Cassandra™ (DDAC) database must combine results from the active memtable and potentially multiple SSTables. If the memtable has the desired partition data, then the data is read and merged with the data from the SSTables. Typical of any database, reads are fastest when the most in-demand data fits into memory. The operating system page cache is best at improving performance, although the row cache can provide some improvement for very read-intensive operations, where read operations are 95% of the load. 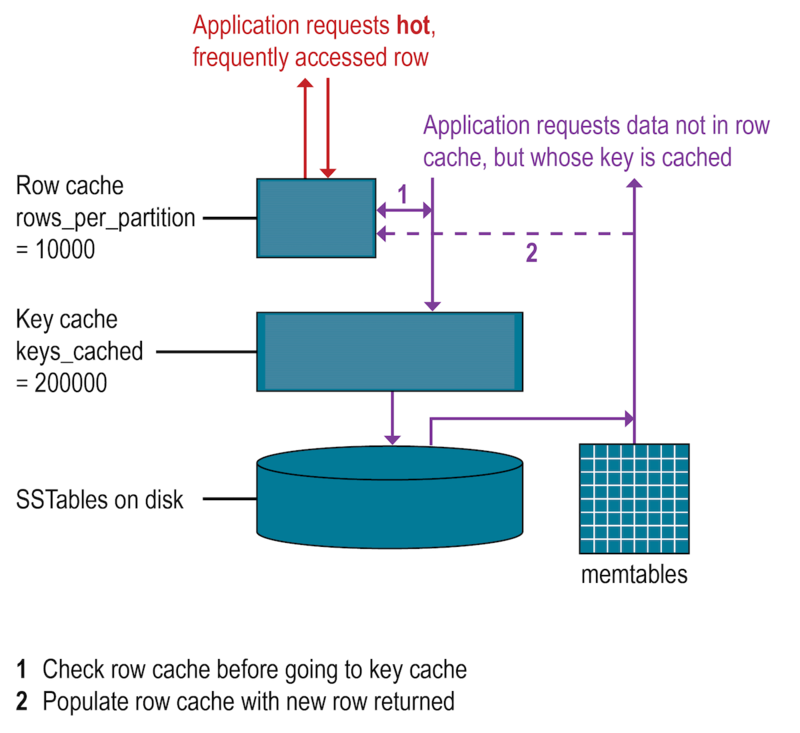 Row cache is not recommended for write-intensive operations. If the row cache is enabled, it stores a subset of the partition data stored on disk in the SSTables in memory. In DDAC, the row cache is stored in fully off-heap memory using an implementation that relieves garbage collection pressure in the Java Virtual Machine (JVM). The subset stored in the row cache uses a configurable amount of memory for a specified period of time. When the cache is full, the row cache uses LRU (least-recently-used) eviction to reclaim memory. The DDAC database checks the Bloom filter to discover which SSTables are likely to have the requested partition data. 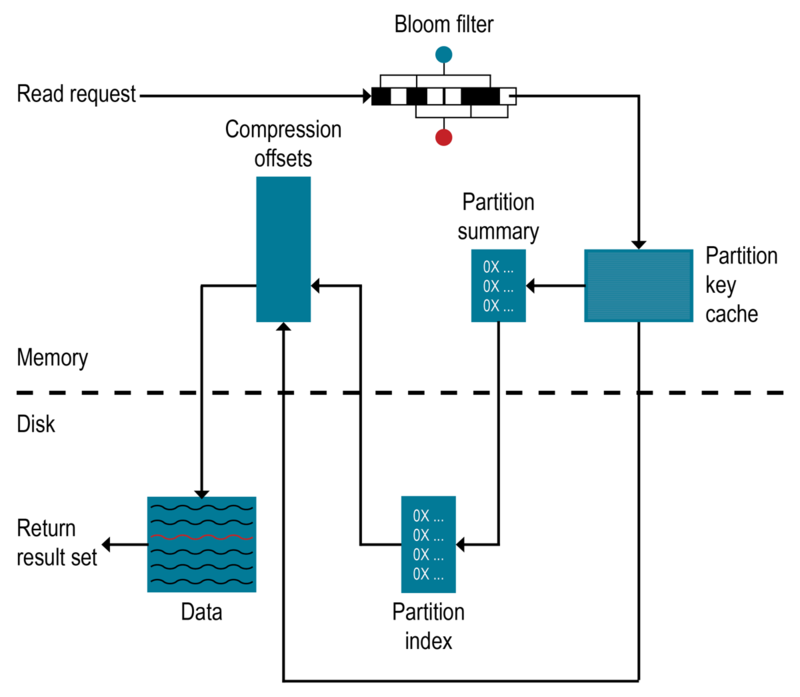 If the Bloom filter does not rule out an SSTable, the DDAC database checks the partition key cache. Not all SSTables identified by the Bloom filter will have data. Because the Bloom filter is a probabilistic function, it can sometimes return false positives. If the partition key is enabled, it stores a cache of the partition index in off-heap memory. The key cache uses a small, configurable amount of memory, and each "hit" saves one seek during the read operation. If a partition key is found in the key cache, the DDAC database can go directly to the compression offset map to find the compressed block on disk that has the data. The partition key cache functions better once warmed, and can greatly improve over the performance of cold-start reads, where the key cache doesn't yet have the keys stored in the key cache. If memory is very limited on a node, it is possible to limit the number of partition keys saved in the key cache. If a partition key is not found in the key cache, then the partition summary is searched.